Manaslu Circuit Trek Nepal offers magnificent views of Mt. Manaslu 8156m - world's 8th highest peak, Ganesh Himal 7406m - the holy mountain and many other snow-capped mountains. Off the Beaten Path crossing through adventurous high alpine pass; Larkya La Pass at 5135 meters. Opportunity to explore the isolated area Hidden Culture Valley on the midwest Himalayan region of Nepal with a subtropical dense forest as well as traditional Sherpa villages with Tibetan culture. Non-Tourist Region Trekking in Nepal covers the excursion of Manaslu Conservation Area Project (MCAP)as well as Annapurna Conservation Area Project (ACAP) of Nepal. Solo Trekking Nepal Map with Cost Price Detail is in our Itinerary. 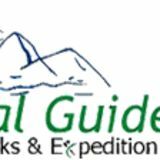 Manaslu Circuit Trek Trip Introduction; ● Manaslu Circuit Trek in Nepal is one of the best general treks in Nepalese Himalayas. Located in Gorkha District the region adjoins with Tibetan Plateau offering its trekkers an amazing adventure experience. ● Non-Tourist Region Trekking in Nepal offers exploration around the remote villages, beautiful valleys and amazing mountain views coupled with a crossing of challenging Larkya La Pass at 5135 meters. 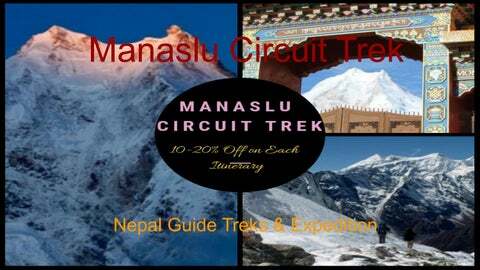 ● Off the beaten path at Manaslu Circuit Trek also includes the exploration of the high and low diverse altitude. Where one gets an opportunity to discover the hidden wonders and the region’s flora and fauna for a lifetime experience. ● Solo Trekking Nepal trail is followed through the sub-tropical forest to the dry arctic zone near to the border of Tibet with Several Mountain, Snow Peaks are attractions for Peak Climbing Nepal. Manaslu Circuit Trekking Itinerary in Nepal Day 01: Arrive at Kathmandu [1345m/4411ft] and transfer to Hotel. Day 02: Sightseeing at Kathmandu Day 03: Drive to Soti Khola [712m/2335ft] [9-10 hrs Drive] Day 04: Trek from Soti Khola to Maccha Khola [883m/2896ft] [5-6 hrs Trek] Day 05: Trek from Machha Khola to Jagat [1415m/4641ft] [5-6 hrs Trek] Day 06: Trek from Jagat to Deng [1804m/5917ft] [6-7 hrs of Trek] Day 07: Trek from Deng to Namrung [2670m/8757ft] [6-7 hrs of Trek] Day 08: Trek from Namrung to Shya [3530m/11578ft] [5-6 hrs Trek] Day 09: Trek from Shya to Samagaon [3541m/11614ft] [2-3 hrs Trek] Day 10: Acclimatization day at Samagaon. Day 11: Trek from Samagaon to Samdo [3872m/12700ft] [3-4 hrs Trek] Day 12: Acclimatization day at Samdo. Day 13: Trek from Samdo to Larkya Pedhi [4494m/14740ft] [5-6 hrs Trek] Day 14: Trek to Bimtang [3720m/12201ft] via Larkya La Pass [5135m/16842ft] [8-9 hrs Trek] Day 15: Trek from Bimtang to to Dharapani [2006m/6579ft] [7-8 hrs Trek] Day 16: Trek from Dharapani to Syange [1194m/3916ft] [5-6 hrs Trek] Day 17: Drive back to Kathmandu [8-9 hrs Drive] Day 18: Free day at Kathmandu. Day 19: Transfer to International Airport for departure.